The client can, at any point in the coaching session declare his/her preference not to discuss a specific issue, by simply stating that they would rather not discuss this issue. The coach agrees to respect this boundary and will not attempt to forward the conversation further along those lines. 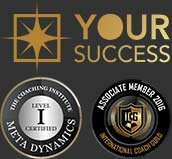 The coach will work within the professional ethics and guidelines as designated by the International Coach Guild. All information about the coach/client relationship will remain strictly confidential except in very rare circumstances where decreed by law; ie. where the court might issue a subpoena for the file or information.